The Philadelphia Eagles and Green Bay Packers will meet in each teams’ first preseason game of the year. The game takes place on Thursday, August 10th and kick off will be at 8:00 p.m. ET. You can watch Eagles vs Packers online easily, even if you don’t have cable. There are some really simple options to get an Eagles vs Packers live stream. The one you choose will likely depend on your location and your preference. Read on to learn more and get yourself set up ahead of game time! NFL Game Pass is a popular streaming service that’ll let you watch an Eagles vs Packers live stream. It’s the official service from the NFL and offers live streams of every single preseason game. The availability of each game depends on your location, due to blackouts. That means, if you live outside of either team’s broadcast area you will definitely be able to watch Eagles vs Packers online. If you don’t get the game live, you can watch it on-demand after it’s over. The service costs $99 for the full season and comes with some awesome features. You get to watch every single regular season game on-demand throughout the season. You can also watch previous seasons regular season and playoff games. There are a bunch of additional features as well, which we cover in our NFL Game Pass review. You can start a free trial right now if you want to try and watch Eagles vs Packers online free! 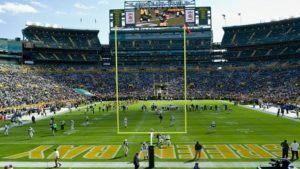 An antenna will be another option to watch Eagles vs Packers without cable. The game will be broadcast in local markets on a network channel, that can easily be picked up with the antenna. It’s one of the best tools for cable cutting NFL fans since you can watch CBS, NBC, and FOX. These all come in HD on the antenna, so you can watch in style on your big screen! This looks like a great matchup between two exciting football teams to watch. Fans of both teams must be excited as the team’s kick off their seasons. If you want to learn more about watching football this year, you’re in luck. We’ve got a full NFL streaming guide that has all the details you’ll need. And, if you have other favorite teams you want to keep up with, we’ve got you covered. Our sports streaming guide has plenty of details on how you can watch all sorts of sporting events without cable.